People have many misconceptions about roof repair, and most of the misinformation is the result of inaccurate information arising out of fear. No matter what fallacies you may hold, we are here to unveil the truth. This one is definitely a classic because nothing in the world lasts forever, roofs included. You can have the best variety roofing material – metal, shingles, or tiles, but that does not mean you wouldn’t have to maintain or replace it. And to help you with that you’ll want to have roofing companies in Houston Texas inspect the roof to see if it’s time for repair or replacement. Roofs too have a lifespan, but like everything else it needs timely maintenance and repairs to help it long last. It can be a DIY project only if you’re a roofer by profession. Otherwise it would be wise to keep it out of your DIY to-do list. Roofing is a complex job that involves many different processes, and consequences of a job not well done can prove to be fatal to your roof. Not if you enlist the help of professional roofing contractors. If the weather is on your side, they can get the whole thing done in one or two days. So, if you need emergency roof repair Houston support, only trust the professionals like us. The repairing is more cost-effective no doubt, however there will come a time when repairs won’t work anymore. It is sometimes better to invest in a replacement and enjoy the peace of mind that comes with knowing your roof will last in the long run. Yes, you can perform small flashing repairs by yourself using rubber cement. If the magnitude of the problem is beyond your capability, we highly recommend that you contact a professional roof repair Houston Company. Not true! Most states have laws protecting the homeowner’s claim if they ever get the roof replaced. This is because living under an unstable or damaged roof is risky, especially if a snowstorm, rainstorm, hailstorm, or a calamitous weather event has taken place. Are you sure about that? Because mostly insurance terms and conditions apply to only well maintained roofs. Therefore, if you have been negligent in proper maintenance of your roof, then the insurance might already be void. Be proactive with roof maintenance and avail the benefits of roof warranty, if required. These were some of the common myths plaguing the roofing industry that property owners and managers need be aware of, especially when procuring roofing services. When in doubt, always speak to an expert and choose only licensed roofers when seeking roof installation, inspection, replacement, or repair services. 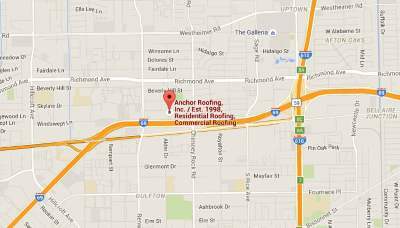 For quality roof maintenance and high-quality products, you can trust Anchor Roofing Inc. We provide quality roof repair and inspection services in Houston and nearby areas. Our team of roofing experts are pleased to take care of all your roofing needs. Feel free to get in touch with us for a no-obligation consultation.